We have had a busy couple of months. We have been to Duluth and to Chicago to robotic competitions. These have become my new favorite "sport". While in Chicago we dropped off 4 lamp shades to have them re-covered. The lamps came from my parents and are probably about 50 years old. They are special because they belonged to my parents but also special because it is very difficult to find this quality of lamp today. They fit our style so wanted to use them in our home - but the lamp shades were showing wear and needed to be recovered. It isn't easy to find someone to do that. I thought about doing it myself then decided I didn't have the experience to do them justice. We finally found a company in Chicago that would re-cover them. We have been busy planning the next 2 months. We want to go to my husband's hometown of Eureka, SD, our granddaughter has a dance recital, our grandson is graduating from high school, we have tickets to a musical at the Civic Center in Des Moines, we have a fishing trip with Jerry's cousin and her family, we need to get back to Chicago to pick up our lamp shades. Whee!!! Yes, you will receive a newsletter in May and June but they will probably be rather brief. Did you discover my mistake in the lyrical row above? Yes, I forgot to add the bows to the packages. I'll try to get that done before the next newsletter. However, if I don't get it done, I'm sure you will understand. Our schedule is fuller than usual. By the way, the lyrical row will be published in July. I'm showing it to you early so that you can plan your fabric selections. I'm so proud to be able to share my latest pattern with you. 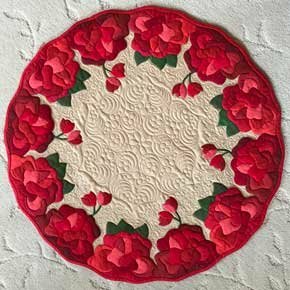 Kay's Circle of Beauty is a 22 1/2" circular table topper. 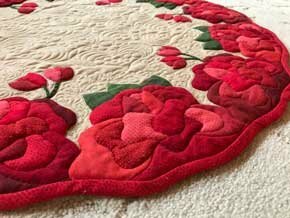 The outstanding feature of this little quilt is the roses which are sculpted with batting. I used a technique that I developed which is based upon back basting. I have also given it a scalloped edge. The pattern is full size although you will have to tape it together. I have included instructions for the sculpting. These instructions include detailed drawings to get you started. The method calls for batting that is even across an entire patch. We Do Not poke batting into the patch before closing it. Instead the batting is cut to the size and shape of the patch and secured in place before the applique fabric is basted into place. The batting will not bunch up as the quilt is washed or handled. I used two types of batting scraps: 1) a fairly flat placemat batting sometimes called interfacing and 2) wool batting. It gives the roses a great deal of definition. If you want a flatter look you can use a 20/80. 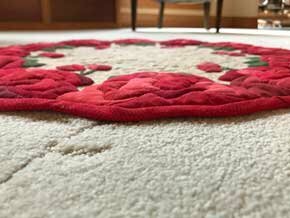 Or, of course, it can be made as regular applique with no batting in the petal patches. Check out the photos below. I think they do a fairly good job of showing the height of the roses that has been achieved with the batting. 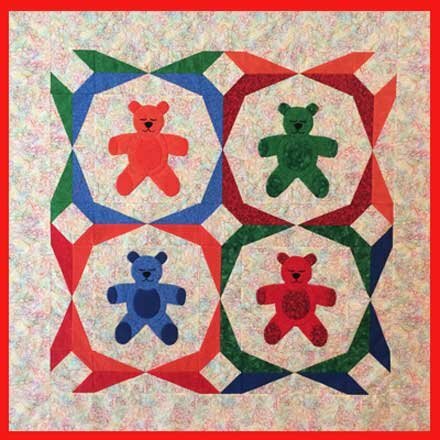 Click here to purchase this pattern for just $15.00 US. I realize that I made a mistake last month. (I can tell because sales were so low.) I didn't include the directions for sculpting these teddies in the pattern. It is the same technique that I have used to sculpt the roses above. I have now written those instructions and will offer the pattern again this month. If you purchased the pattern last month, I will be mailing the instructions for sculpting the teddies to you. Check your mail box. You should have it in about a week. If you purchased this pattern and don't get the instructions within two weeks, send me an e-mail. Click here to purchase "Sleepy Teddies" for $10.00. I'm also going to offer the same special again this month. Purchase both "Sleepy Teddies" and "Froggie, Froggie" and I'll also send you "Delightful Flight" and "Baby Love My Way". Have you had the chance to check us out on Facebook. 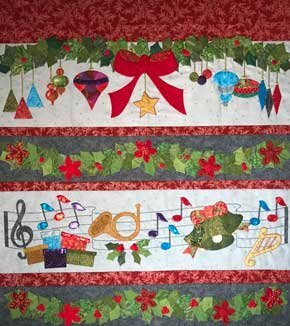 I have posted several videos that show how I have made some of the elements in Ann's Lyrical Christmas. This month I want to promote your section. There is a section on my website called "Visitor Posts". 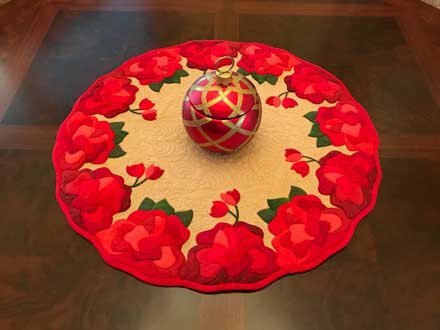 It is here that you can post your photo of your applique projects. Click the link to the right and you will be taken to this section. I would encourage you to post your photos. You may also ask applique related questions. Hopefully we will be able to help you. Click here to find us on Facebook. Click here to view our visitor posts on Facebook. Jerry and I have decided to visit our New England states in the fall of 2018. Twenty-two years ago we made it as close as up-state New York. This time we hope to visit all of these historical states. We will be traveling between 8/15/18 and 10/6/18. I would like to give trunk shows and workshops on this trip. I have prepared a PDF file that describes the workshops that I offer. Click here to download the baubles row. Be sure to read the instructions. You will need to sew a border of red fabric onto the light gray background fabric before tracing the pattern. Some of the holly extends up into the red border. Thanks for joining me this month. Click here to download a PDF file of this newsletter.